Parenting can be difficult in itself, but being the parent of a 15-year-old with autism and epilepsy can pose an extra dose of challenges. INDIANAPOLIS -- Parenting can be difficult in itself, but being the parent of a 15-year-old with autism and epilepsy can pose an extra dose of challenges. Jo Garrett has to deal with people saying negative things about her son, Taylor, all the time. So when the employees of an Indianapolis haunted house went out of their way -- way, way out of their way -- to give Taylor a great experience over the weekend, she wanted to tell the world about it. Jo and Taylor drove from Carlisle, Indiana Friday to go to House of Trepidation, located at 1929 S. Meridian St. After they went through the haunted house, an employee remembered Taylor from a year ago, and that he has special needs. A few employees talked to him and shook his hand. 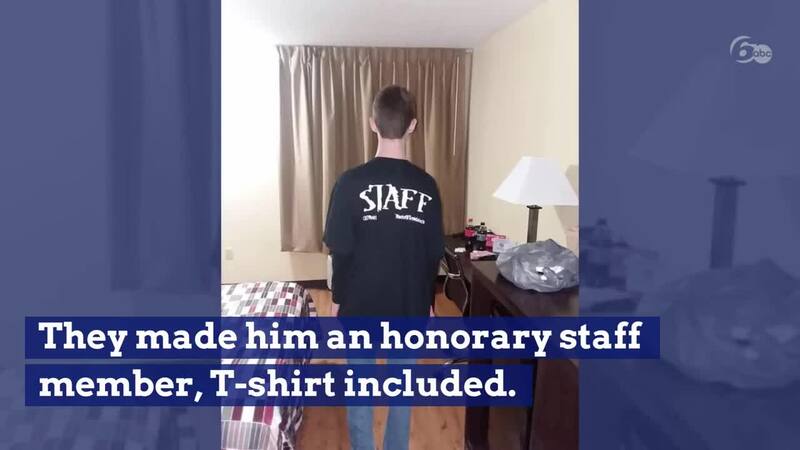 They even made him an honorary staff member -- T-shirt included. They asked to take a photo with Taylor in his new "Staff" shirt. "He was so overly excited," Jo said. "He had the biggest smile on his face [in the photo]. He doesn't make eye contact with the camera very often." Taylor loves Halloween, Jo said. He looks forward to haunted houses all year. "Halloween is his Christmas," Jo said. Seeing how excited Taylor was about the shirt, the staff asked if he'd like to return the next night and become an honorary haunter, complete with makeup. Jo said she was concerned about the makeup part since Taylor doesn't typically like people touching him. But this is Halloween, after all. "He actually let her do it," she said. On Saturday, Taylor was positioned inside a "cage" with another staff member. Jo was nearby, watching from a hallway. But of course, he was a natural. "He would giggle every time he got somebody to scream," Jo said. "That was amazing. It was something neither me or my child will ever forget." House of Trepidation owner Ken Carter said he just wanted Taylor to have a good experience, and that it gave him a new desire to help people like him. "Neither of my children are autistic," Carter said. "It really opened my eyes." Carter said this summer, the haunted house will host a high-sensory night to help give others a great time. To thank the people at House of Trepidation, Carter said Jo brought all 80 staff members cupcakes and cookies. But that's a small gesture for Jo, who said what they did for her son fills her heart. "In a world where you see so much negativity ... when you have an opportunity to call somebody out for something positive that they didn't have to do they made it something so much more," she said. "They created memories with my child that will last forever." After the personal touch the staff gave her son, Jo said they will be returning to House of Trepidation despite the distance from Carlisle. "It's 97 miles and we will make it every year," she said.